A few weeks ago we bought a painting in the Berkshires. To be precise, it's not a painting - it's an "assemblage," which is defined as "a sculptural composition consisting of an arrangement of miscellaneous objects or found materials." 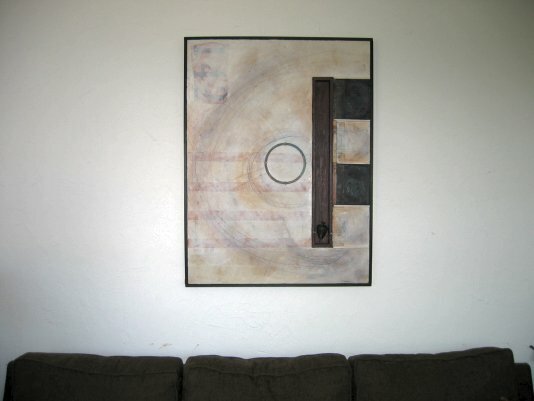 Our assemblage is by Graceann Warn, an artist based in Ann Arbor, MI. Our assemblage, entitled "Laws of Motion," is not featured on Ms. Warn's website, but can be seen (at least for a while) at the website of the Hoadley Gallery at which we purchased it, and also right here, hanging happily on our living room wall. What cannot readily be seen from this picture, or from the one on Hoadley's website, is that the dark portion on the right-center of the assemblage houses a lead bob pendulum and a piece of a yardstick. Also the circle in the center is a copper gasket of the sort used to seal Conflat flanges in the vacuum systems typically used in physics experiments. The whitish background, too, bears the ghosts of circular tracks evocative of the paths of charged particles through bubble chambers and other particle detectors of early experiments in high-energy physics. In short, what David and I liked about the assemblage was the way it evoked so many eras of physics, from Newtonian to modern, and so many eras even in the cycle of an individual's study of physics, from experiments one does in high school with a yardstick and a plumb bob to the down-and-dirty realities of today's experimental physics - tinkering with the gaskets on a vacuum chamber. Well, I have an oil painting of a shock tube on my wall -- but it evokes only one era of physics, that one rather directly.